The crew of the 60′ Ritchie Howell, Blue Runner, were nice enough to invite me out for a quick trip today. We trolled lipped diving plugs for grouper around Devils Point for a bit and picked up one grouper. Just outside off the edge we saw a frigate and pushed off to check him out. 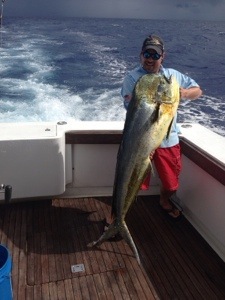 We had a few Mahi swimming behind the boat and caught a few small tunas on the lipped divers. After trolling around we made our way back towards Hawks Nest and had a double of wahoos! One pulled off and we got the other weehoo. Fun little quick trip. Today we had a steady 15-20 knot wind out of the SSW. We ran past Devils Point with no signs of life and dropped in at Dolphin head. The first two hours were quiet until we had a sailfish bite on the right long out at the tip of Columbus Point. We came tight and got a quick release. Shortly after we had a quad of wahoos go screaming. Unluckily we weren’t able to get anything to the boat between pulled hooks and sharks. Joe worked the area hard but nothing else wanted to eat so we pushed back into the pocket where we plucked a few dolphin and pulled the hook on a wahoo right next to the boat. Tough day, but much better action. Today we had flat calm seas early in the morning and we headed out looking for dolphin and hopefully a billfish or a wahoo. After about an hour and only one mystery bite, the wind came up out of the West. Everytime we get a west wind here, the bit turns off like a light, and that is did today! Today was our last day with Jeff and Sid. Ron had to head out this morning to get back to the states. It was calm early on in the day and we started fishing around Devil’s Point where we picked up some dolphin in the 15 pound range. As the day went on the wind picked up to about 15 knots out of the East as we got to Columbus Point. 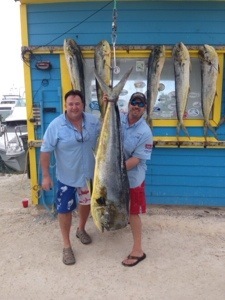 We picked up a few more dolphin here and pulled off a wahoo, but other then that it was fairly slow. We paddled back inside and after a long lull the right long rigger gets another dolphin. We weren’t in a sharky area so we were able to leave a few baits in the water and POP, the left long rigger clip releases and we see a solid jump from a good sized bull dolphin. The bull took a strong run with 20 pounds of heat on him! We gaffed the cow Jeff had on and went after Sid’s fish. As Joe got back on the fish, we got to the leader quick and we saw it was a good sized bull, and it seemed like it still had plenty of fight left. Surprisingly, it got just in range of my gaff, and after a shot in the head we swung it in the boat where the fish went ballistic! We all guessed it was in the mid forties, but we got back in and weighed it on the certified scale; 54.6 pounds! Awesome fish for sure, and Sid’s second amazing trophy fish of this trip. Congratulations Sid! We ended the day with 8 dolphin. Not too bad at all, and ending on a high note was excellent! Today we spent the morning fishing SanSal in 3-5 foot seas with winds out of the NNE at 15 knots. Yesterday’s catch was going to be tough to beat, but we gave it all we had. The morning started with a mystery bite on the left long that pulled off. 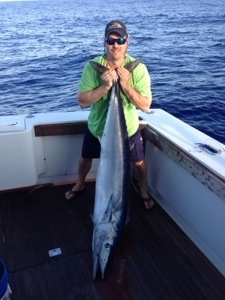 Shortly after we had a wahoo sky out of the water and land on the right short rigger bait. Unfortunately the wahoo missed and got snagged in the belly, so the tax man (sharks) took their half and left us picking up the pieces. After a little lull we pushed off the ridge and out to the hump where there were quite a few frigates working. We picked through some decent dolphin and another small weehoo on an all black Yo Zuri Bonita Plug behind the trolling lead. We had a few more weight bites here, one of which turned out to be a billfish, but otherwise the action was slow. At 1 pm we made the run back to Cat Island and dropped in at the tip of Columbus. The water was blue and the dolphin were snapping. We picked up a few dolphin here at Columbus Point then moved inside where the water turned green, and looked lifeless. We picked it up, made our way back into Hawks Nest Marina, and settled back into home. Back at it again here in Cat Island tomorrow. 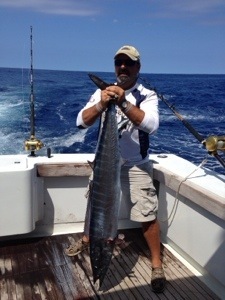 Today was our second day here in San Sal and it produced exactly what we were looking for, a 107 pound wahoo! With calm seas and mostly sunny skies, the weather was perfect again! First bite on the deep rod with a split tail mullet winds up with Sid hooked into a solid wahoo. It made a short screaming run, then had enough. I wired it up to my gaff, joe ran down from the bridge to sink the second gaff in and on the deck she went. Wahoooooooo!!!! We managed to get two more wahoo, one got Sharked unfortunately and we got half, and also 4 nice dolphins. The action was spread out throughout the day, and there was plenty of life between the birds and fish breaking the surface all day. Extremely fun day of fishing! We got out first group (Jeff, Sid, and Ronny) in at Cat Island on Monday night and got all settled in. 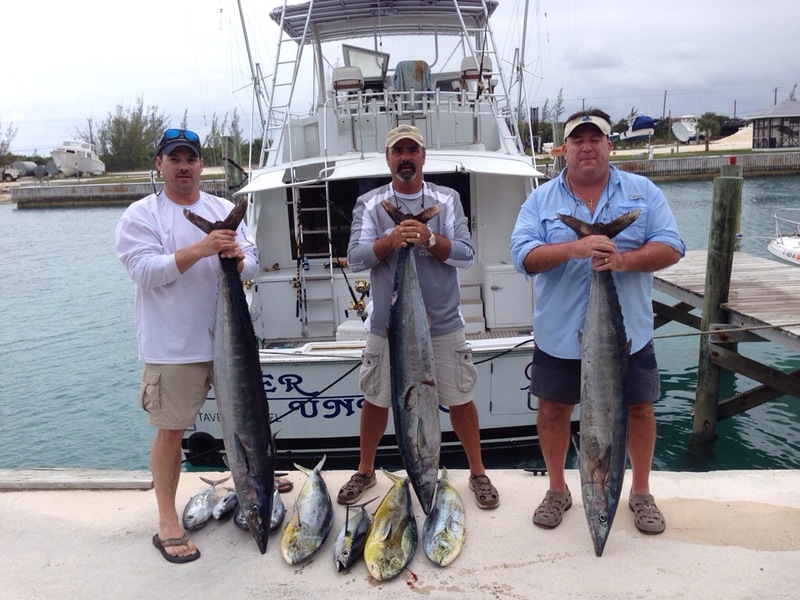 We started off fishing Cat on Tuesday and got into a few dolphin and small tunas, but no wahoo. It was blowing 15-25 out of the south all day, but we still made our way to San Salvador. Today (3/19) we had flat calm seas and it was cloudy throughout most of the day with a little rain. We fished the ridge with one wahoo bite that bit the trolling weight, but otherwise slow start. Joe pushed off to the hump where we had 4 wahoos on. Lost one on the initial run, and put 2/3 into the boat in the 40-60 pound range and were Sid and Ronny’s first wahoos. Congratulations guys! We dropped lines it right away and WHAM! 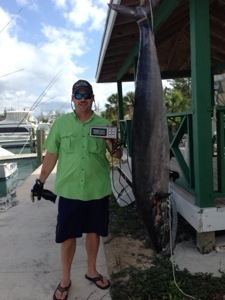 Another wahoo on! Jeff brought in the 35-40 pound hoo nicely. We started seeing a few more frigates and dolphin were picking at a bait here and there as we out a few of those into the box along with a lot of little blackfin tunas. We had a nice bull that was easily over 40 pounds eat a skirted ballyhoo behind the trolling weight, but managed to throw the hook after a couple amazing jumps. That one was a heartbreaker! Anyway, pretty solid start to the trip with a great group of guys. Looking forward to another 2 days fishing in San Sal!